Ginya Izakaya, located at Suite A5 on 1700 Northside Dr., blends in with the countless stores and eateries surrounding it. As I entered the restaurant, ethnic decor and dim lights created a relaxed ambiance. A waiter led me past countless unoccupied tables to a dark corner across from the entrance to the kitchen. The secluded spot provided me with a beautiful view of the entire kitchen, sights and sounds included. After a few moments, a waiter arrived, ready to take my order. He eagerly pointed out his favorite dishes and recommendations. My companion and I chose the two most popular items: Tonkotsu Ramen (topped with chashu pork, boiled egg, bamboo shoots, scallions, and red ginger) and the similar Spicy Tonkotsu Ramen (served in spicy broth with chashu pork, boiled egg, bamboo shoots, and scallions) as well as Chicken Karaag (a Japanese-style fried chicken) for $5. Although our Tonkotsu bowls arrived, filled to the brim with ramen, each dish clocked in at a pricey $10 dollars. My ramen looked as bland as it tasted; the whole dish was an unfortunate color. Maybe the aesthetic appeal contributed to the dish’s bland taste because it was pure beige color. The entree had a nice consistency, but it had an aftertaste of freezer burned pork. The pork in the broth was rough and chewy, with little to no spice. The most surprising part of the otherwise boring dish was its bamboo shoot garnish. 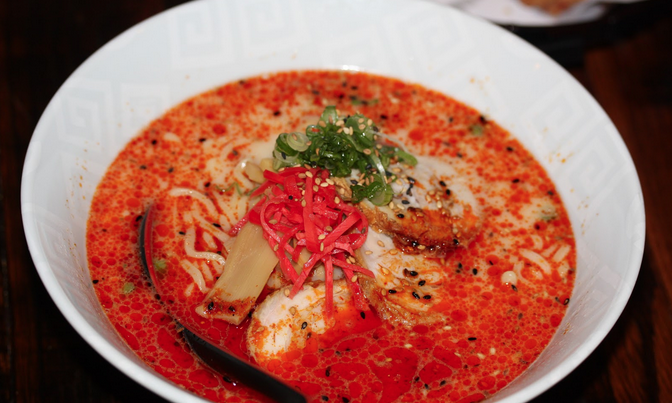 The SpicySpicy Tonkotsu Ramen looked infinitely more appetizing. It had red coloring and also contained a heaping amount of noodles. The pork was cooked well and had a better texture than that of the previous dish. Though thankfully not bland, the dish was almost too spicy. I couldn’t really taste anything other than the spicy flavor of the broth. I was immediately intrigued by the Chicken Karaag. Despite the dish’s appealing presentation, I was disappointed with its taste. Within the first few bites, I realized the meat was grisly and tough. One of its few redeeming qualities was its juiciness and crispy breading. For dessert I ordered Tempura ice cream for $6. The fried green tea ice cream ball with a generous serving of whipped cream and a cherry compensated for my mediocre meal. The warm fried batter deliciously offset the the cold cream and chocolate sauce. Overall my trip to Ginya Izakaya was mildly disappointing, but the kind wait staff definitely improved my experience. Most of my food was also bland or overly spiced. I wouldn’t revisit Ginya Izakaya for anything but the killer Tempura ice cream.